Were you hoping that Oculus’ big push for virtual reality would include a revolutionary controller? Something that would let you actually touch the virtual worlds? You’ll get it, but not for a while. Instead, the final Oculus Rift is going to ship with a standard Xbox One gamepad. Yawn. Don’t get me wrong—the Xbox One controller is a great gamepad, but it feels like an odd device to ship with the Oculus Rift. The Rift isn’t the only (or even the first) consumer virtual reality headset, but it’s definitely the most recognizable. It helped drag the idea of virtual reality back into the public eye. Oculus VR has spent millions researching new and alternative game controls. It’s been teasing a new paradigm of personal entertainment for years and now, when it finally reveals it—it’s using the same ancient dual-stick gamepad we’ve been using for a decade. Really? Really. 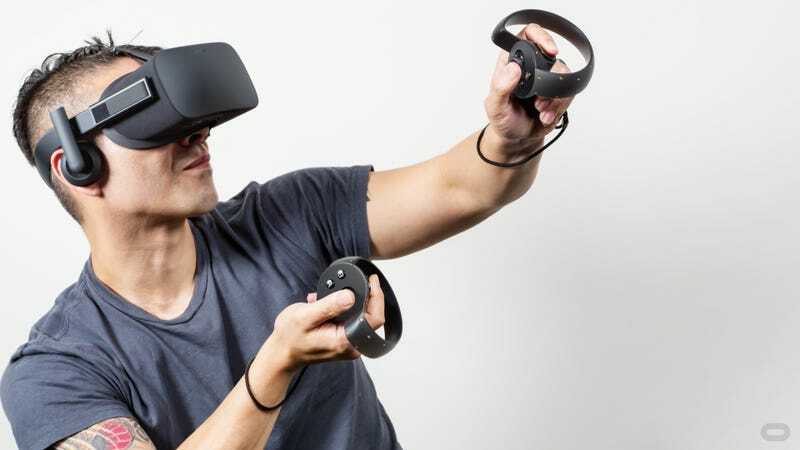 The move makes some degree of sense: Oculus founder Palmer Luckey says some game experiences, like Lucky’s Tale and Eve: Valkyrie specifically, just play better with a typical gamepad. He looked at the audience apologetically as he said it: “They just do.” Privately, he also tells us that it’s nice to have a second hand to push against—with one-handed controllers, you’re pressing against your palm and it can be a little awkward. He’s right—buttons are wonderful, and in a seated or third-person game experience, they’re pretty hard to beat—but in the face of the amazing 1:1 hand tracking tech Valve showed off with its Lighthouse controllers, it doesn’t feel good enough. And at first, that’s all company let us believe they were going to give us in terms of controllers. That’s the Oculus Touch prototype controller. This is what we expected to see: a full motion controller designed to help you touch and interact with virtual worlds as if they were real. It can be tracked in real space thanks to infrared LEDs that are tracked by cameras, just like the Oculus headset. It has buttons, analog sticks and multiple triggers—one for gripping items with your palm (say, picking up a gun) and one for squeezing with your finger (say, for firing that gun). Palmer says it’s the kind of controller that will let you pick up items, use them and then immediately throw them to the ground without a second thought. It sounds like the kind of controller the Oculus Rift needs—something to compete with the amazing Lighthouse wands Valve showed off at GDC—but it’s also problematic. Oculus made it clear that the Xbox One was the default controller for the Oculus Rift, the device that comes with it, in the box. Not this revolutionary, do-everything gamepad, but the same dual-stick layout we’ve been using for years. That really worries me. It’s a question of incentive: if game developers know that every Oculus Rift owner has an Xbox One gamepad, they’re going to create content designed around that gamepad. Likewise, if they know that only some Oculus Rift owners are going to have the presumably sold-separately Oculus Touch controller, they have less incentive to pour money into making games for it. By shipping the Rift with a traditional game controller, Oculus could be shooting the next generation of game input, and by extension its very own product, in the foot. I can’t imagine Oculus doesn’t know this, but the more I think about it, the more I realize they might not have a choice. The Rift has been teased for years, probably longer than any other consumer product. It’s launching after the HTC Vive, its nearest competitor—and its new motion controller isn’t even close to being ready. Oculus can’t wait another year to launch the Rift. It needs to launch with something. It’s stuck with the Xbox One gamepad, like it or not. Not having the right controller right now is a problem, but at least the future looks bright. The Oculus Touch motion controller is going to launch as a developer kit next year, after the launch of the Rift itself. It’s going to be worked on, refined, improved and hopefully, developers will flock to it. Eventually, Oculus tells us, it will be packed in with a future version of the Oculus Rift—the way it needs to be. Contact the author at buckley@gizmodo.com.